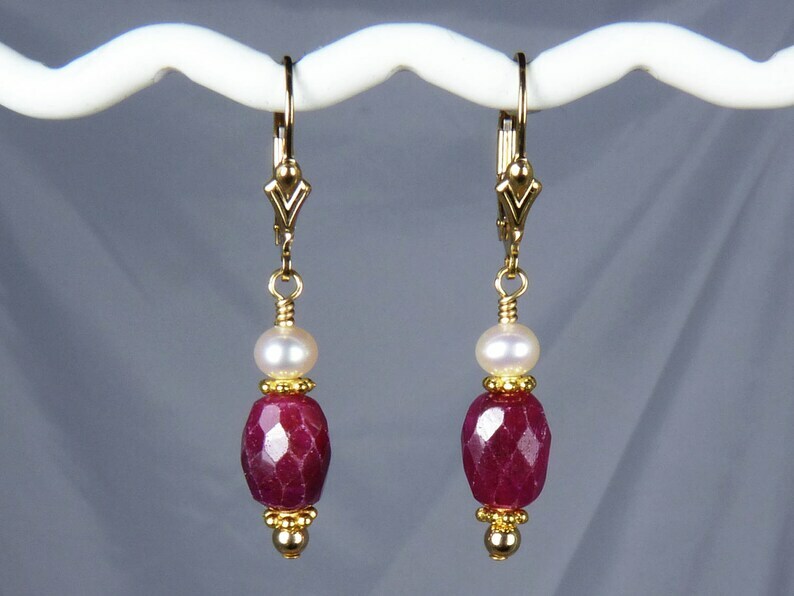 Genuine ruby, pearl, and gold leverback earrings. Faceted, genuine, barrel-shaped, rubies are wire wrapped together with lustrous white freshwater pearls and shiny gold beads in these elegant earrings. The 9mm x 7mm (3/8" x 5/16") dyed rubies are a beautiful cranberry red color, and the facets sparkle as they catch the light. The shiny round beads are 14K gold filled, and the spacers are 22K gold-plated lead-free pewter. The rubies and gold beads are wire wrapped on 14K gold filled headpins. All the rubies used for this earring design are from the same strand and will be very similar. The gemstones dangle 23mm (15/16") from 14K gold filled leverback ear wires, and the earrings measure 39mm (1 9/16") from the tops of the leverbacks. These pretty ruby and pearl earrings would be a perfect gift for Valentine's Day! All RazzleBedazzle earrings are packaged in gift boxes, perfect for gift giving. Absolutely beautiful earrings!!! Thank you! These earrings are gorgeous! Perfect Mother's Day gift!